Glyn Milburn is a Stanford graduate, a retired NFL football player, real estate investment fund manager and entrepreneur who divides his time between Los Angeles and Texas. With all his successes, he was not satisfied with the traditional 401(k) approach to saving for retirement. Milburn, 39, and his wife Toya have two children, a daughter, 6, and a 4-year-old son. They wanted to find a way to save that was less risky than traditional investments. Like many Americans, he saw 40 percent of the value of his 401(k) evaporate in the 2008 crash. 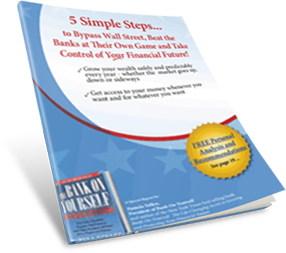 About three years ago, Milburn heard on the radio about Bank On Yourself, the savings strategy popularized by the New York Times Bestseller Bank On Yourself by financial security expert Pamela Yellen. He got in touch with Bank On Yourself Authorized Advisor Teresa Kuhn, who answered all his questions and helped set up a policy specially designed for his family and situation. “One of our goals is to grow our resources to help pay for college expenses for our two children and to recapture interest paid for my major purchases,” Milburn says. Since opening his policy about three years ago, Milburn has borrowed $50,000 to purchase the two vehicles. “We are paying ourselves back and continue to see our policies grow each year,” he says. Unlike with 401(k) plans, Bank On Yourself policyholders can borrow against the value of their policies without selling any investments. There are no restrictions on loans and you can pay the loan back on your own schedule. Some companies don’t allow you to take loans from your 401(k). If your company does allow it, you must adhere to strict government rules about how much you can borrow and when and how you must pay it back. And if you lose your job or change companies, you must pay your loan back in full within 30-60 days, or you’ll have to pay income taxes on any outstanding loan, plus a penalty. Policyholders repay interest to themselves instead of to a bank or other third party lender. And some companies offer policies that allow you to earn the same interest and dividends as though you had never borrowed from the policy. After suffering financial losses in 2000 and 2008, Milburn is glad his savings are secure and growing no matter what happens with the stock market.